My Fair Lacey is released! This sounds like she’s been held captive somewhere, doesn’t it? Not so. Well, unless you count my computer as a place of captivity. Although if we’re speaking metaphorically, I’m the only one that my computer really holds captive because I will not be truly free until I finish Slayers 4. But we’re not talking about that right now. (Janette looks around for chocolate.) Because we’re celebrating a charming romance novella (It’s 125 pages, so it’s half a book.) 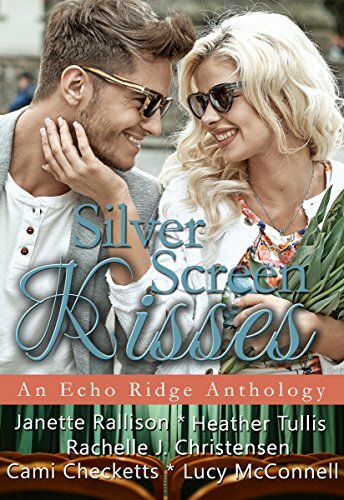 that’s part of a romance anthology with romance veterans Rachel J Christensen, Cami Checketts, Heather Tullis, and Lucy McConnell. If you’ve ever sung one of the My Fair Lady songs or wished Professor Higgens was younger, hotter, and nicer, you’ll love this story. Lacey Johnson has dreamed of opening a restaurant for years. All she needs is one little loan to make it happen. But with the way Lacey talks and dresses, she looks more like someone who would hold up a bank than someone who’d ever get a loan from one. When Garrett Halifax, her roommate’s Harvard-educated brother, volunteers to change her image and teach her to speak correctly, she jumps at the chance. But she quickly finds she’s in over her head. Pretending to fit in with the town’s elite is harder than she thought, and despite her best efforts, she’s falling for Garrett. Could someone who is handsome, rich, and educated ever consider her as more than just a project? Romantic happiness is waiting for you when you click here to buy the book! Yay! So glad this one is now out, it’s such a great story!